Fu Baoshi was born in Nanchang, Jiangxi province. From 1933 to 1935 he studied in Tokyo at the Imperial Art Academy, and on his return taught at the Central University in Nanjing where he was professor from 1935 to 1952; during the Sino-Japanese War he moved with the University to Chongqing (Chungking) in Sichuan and in 1946 he returned to Nanjing where he spent the rest of his life. He sat on artists' committees at both national and local levels and in 1959 collaborated with Guan Shanyue (q.v.) on the huge painting 'This land with so much beauty aglow' in the Great Hall of the People at Tiananmen Square, Beijing. Fu wrote widely on the history of painting and in the 1930s developed his own style, to which he remained true throughout his career; he was deeply influenced by the Qing indiviualist painter Shi Tao, of whom he wrote a biography. Together with Huang Binhong (q.v.) he is regarded as the greatest literati painter of the twentieth century. See also Cat.No.31. In this painting Fu Baoshi has used the classical landscape medium of ink combined with pale blue and buff colours. 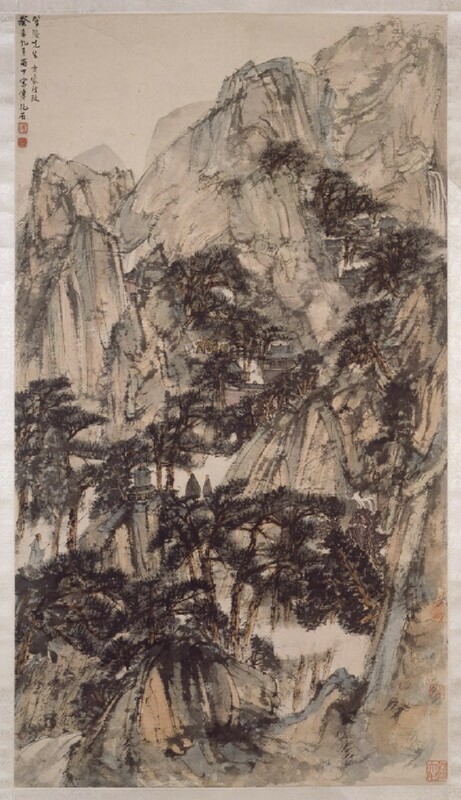 The repetition of slightly conical forms appears in several of his landscapes of the 1940s and early 1950s, and perhaps derives from the work of the early Qing dynasty individualist painter Shi Tao, whose work was a source of inspiration to Fu and whose influence is clear in some of his earlier paintings. The figures in this painting, like many in Fu’s denser landscape compositions, are small but centrally placed. The inscription states that the landscape was painted in Sichuan province. In 1943 when this landscape was painted Fu Baoshi was living in Chongqing in Sichuan province, as the National Central University where he worked had moved there from the capital Nanjing along with numerous other institutions to avoid the war with Japan. In that year he held exhibitions in Chongqing and in the provincial capital Chengdu. The exhibition of more than 100 paintings that took place in Chongqing the previous year had been his first for nearly ten years, as he had spent most of his time writing. In 1934 he had a brief exhibition of nearly 200 works in Tokyo, where he was studying at the Imperial Academy of Fine Arts. A leading figure in that institution at the time was Yokoyama Taikan (1868-1958), whom Fu came to know quite well and one of whose paintings is exhibited in the ‘Japan from 1850’ gallery.